WiKaDuKe is an acronym that stands for: Will, Kane, Dupage, and Kendall counties. This league is geared towards competitive women looking to play real matches. Come with a partner and play a practice match, get your extra day of tennis in, and meet some great women from all around Chicagoland. Matches begin at 10am, and they finish when the match is complete. Best of three sets, regular scoring. No more watching the clock, no modified scoring. It's tennis the way it was meant to be played. And at only $10 per match this is the best deal around. 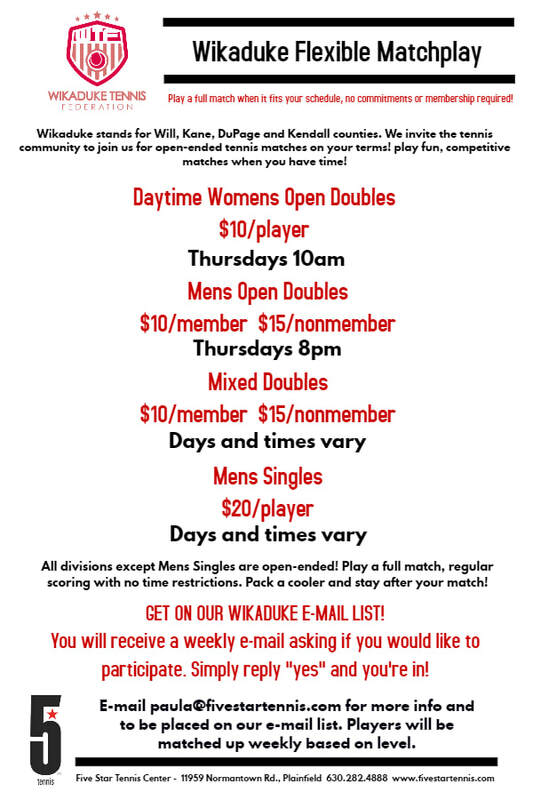 Ladies Open Division (Open Division) plays every Thursday at 10am. Matches are held weekly yearround. Spaces are reserved weekly. Reserve your spot by e-mailing Paula Endress: paula@fivestartennis.com and indicate whether you will be coming with a partner. Paula can place you with a partner if you plan to come unattached.